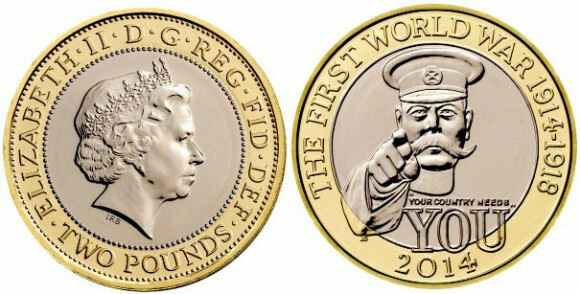 It's been reported in the UK media that the Welsh National Party, Plaid Cymru's former Welsh Assembly Member, Dai Lloyd, said the new £2 coin, which features Lord Kitchener and the words "Your country needs you" glorifies war and should never have gone into circulation. Dr Lloyd is also credited with saying that the image "epitomises the blinkered mentality that sent millions to their deaths in the trenches" and that the image will offend the Muslim world. I don't remember him condemning the £2 coin issued to commemorate VE (Victory in Europe) day so presumably he doesn't feel that commemorating victories is glorifying war. Issuing coins that glorified military capability and commemorated victory was an essential part of the propaganda extolling the virtues of Roman emperors, however commemoration of victory can be seen on coins issued by the ancient Greeks and Britain and many other countries since ancient times, and on banknotes and stamps. I don't agree that Lord Kitchener was solely responsible for the quoted blinkered mentality because there are many other politicians and generals who shared that mentality. If we were to condemn Lord Kitchener for that, we'd also need to condemn Haig, French, Joffre, Robertson to name but a few. Will the image offend the Muslim world? Perhaps and if so that's regrettable, however I suspect that it would be difficult to honour any great military leader of that time who hadn't been involved in campaigns in the Islamic world. I think Muslims should honour Kitchener for some of his good works; after the Sudan war, he ordered that the mosques in Khartoum should be rebuilt, he condemned Christian missionaries and tried to dissuade them from converting Muslims and he instituted a reform that recognised Friday, the Muslim holy day, as the official day of rest. Kitchener was also a key figure in the mapping-survey of western Palestine and those maps were the basis for the grid system used in the modern maps of Palestine and Israel. In World War I, soldiers' standard knitted socks had a seam up the toe that was uncomfortable. Kitchener is also credited with the invention of a seamless sock pattern that brought comfort to thousands. I don't think the words are glorifying war. The iconic image of Lord Kitchener beckoning has been used on adverts for lots of different products, posters, mugs, T-shirts. The original poster said "Join Your Country's Army" whereas the coin says "Your country needs you" and that surely, is true of any country and all its citizens. I suppose a concerted effort by a campaigning group such as 38 Degrees might persuade the British Parliament that the Kitchener £2 coin should be withdrawn but I doubt it. If the coin were to be withdrawn after issue, I would encourage UK collectors to save a few examples because they would become sought after by collectors and sellable for more than £2.